Middle North Falls is a tantalizing treat to discover as it emerges between the trees and around the bend when you walk from Drake Falls, a tiny 0.2 miles. Middle North Falls 103 feet high. Pictured here from a small wooden deck is Drake Falls. Drake Falls is a cute little watershoot, maybe 45 to 50 degrees in slope. Drake Falls was named after Mr. J.D. Drake, a Silverton photographer. He was instrumental in the creation of Silver Falls State Park, which was dedicated on July 23, 1933. The fall is a steep rapid rather than a vertical waterfall. The layers of rock are equally hard and erode at the same rate. If you need a little coaxing, let me tell you that the extra 0.1 miles you have to walk from the main trail to visit Double Falls is quite worth the little stroll around the bend. Double Falls is the highest waterfall in Silver Creek Falls State Park. Water drops a full 178 feet before splashing into the small pool at its base. Double Falls is a combination of two individual waterfalls. The highest, and smallest, waterfall can be seen near the top right of the picture. Lower North Falls is a short 1.3 mile hike from Lower South Falls. Lower North Falls is 30 feet high. Lower South Falls is just a little over one mile downstream from “South Falls.” The hike is quite easy, but there are some steps that must be traversed to reach the trail which goes behind the falls. Some times these steps can be wet and muddy so watch your footing. Lower South Falls 93 feet high. Nestled in the hills east of Salem, Oregon, Silver Creek Falls State Park is a favorite of both locals and out-of-towners alike. An easy half hour drive from Salem, you would be hard pressed to find a better park in which to observe so many beautiful waterfalls. Silver Creek has two branches, the north and the south. South Falls and Lower South Falls are both formed by the southern branch of Silver Creek. The northern branch contains the large remainder of the waterfalls found in this park. The best times of the year to view waterfalls is shortly after the spring snowmelt has begun. This will allow you to catch a view while the waterflow is at it’s maximum. April has been proven a good viewing month. Take a hike with us as we visit the many beautiful waterfalls that Silver Creek’s two branches have developed. Hikes vary in distance from 0.5 to 7.5 miles round trip. hiking distance Trail Description – Click on link(s) for full details. 0.5 Hike from park HQ to South Falls and return. Most of the trail is paved but portions are steep and wet so use caution. 5.0 The Maxi Tour – Visit 6 of the 10 major waterfalls. 7.5 The Grand Tour – Visit all 10 Silver Creek waterfalls. Oregon State Park day use fee $3.00. The automated permit system accepts $5, $1 and $0.25. East of Lincoln City, OR, is Drift Creek Falls. This short hike will only take an afternoon. 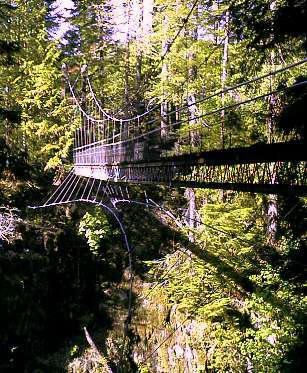 Just before crossing the gorge that Drift Creek Falls empties into you will walk across a 240 foot suspension bridge. This is longest suspension bridge in Oregon or Washington State. Looking down 100 feet below you can see the pool created by the waterfall. After crossing the bridge it is just a short hike down to the creek. You can walk right up to the pool under the waterfall, take a dip if you dare (burrr). Here you will find a host of small animals and a large variety of ferns. Drift Creek Falls is 75 feet high. Take Highway 18 west from Salem. About 4 miles before Lincoln City you will see a brown park sign for Drift Creek Falls. Turn Left onto the side road.